With Summer fast approaching, we begin to dream of tropical vacations, refreshing cocktails, and letting our skin finally soak up some sunshine. 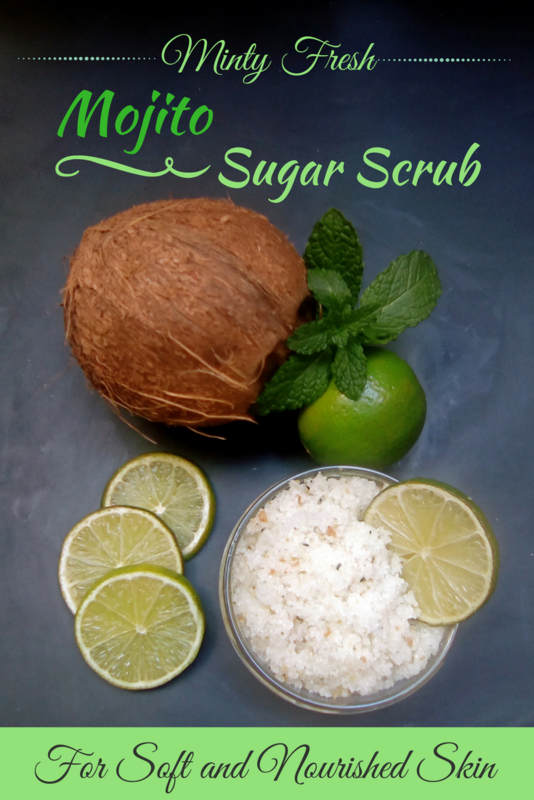 So what better way to say goodbye to the dull Winter than to scrub it’s memory away with an invigorating and minty fresh Mojito Sugar Scrub? Every once in a while, our skin needs a little help with removing dead skin and impurities to let the newer layers show all their radiance… and this scrub is excellent for not only exfoliating, but also for nourishing and hydrating at the same time! Oh, and have I mentioned it smells (and tastes) amazing, too? Sure, you can buy a fancy scrub, but making one at home is so much better because you can adjust it to suit your skin’s needs and make a bunch of it at a fraction of the cost. It’s also simple and beautiful, making it a great gift idea for just about anyone! Optional: Grated Lime and lemon rinds, as well as dried peppermint leaf flakes for extra fragrance and color. Stir all ingredients together in one large container. Done! Body Scrub – Take a good dallop of it at a time, and under the shower give your body a good scrubbing. Remember to use less pressure on any sensitive areas, like face, chest, and neck. You’ll notice there will be no need for moisturizing afterwards thanks to the coconut and essential oils. Hand scrub – You’d be amazed at how nice some newly exfoliated hands feel! Scoop out about a spoonful and scrub your hands just as if you were washing them with soap and water, then rinse and pat dry. Make sure to do this over the sink just in case some sugar granules drop off. Lip scrub – Lip scrubs are all the rage these days, and they are no different than any other sugar scrub. Since all ingredients in this recipe are edible (and delicious! ), feel free to dab some on your lips, rub your lips together, then rinse, wipe off, or lick up. When it comes to topical applications of sugar, it is actually quite good for you. Sugar, as mentioned earlier, acts as a mild exfoliant that removes dead skin cells, and in comparison to salt, it is much less abrasive, making it suitable for more sensitive skin types as well. It also contains glycolic acid, which is in the alpha hydroxy acids (AHA) family of agents popularly used in chemical peels and skin rejuvenation creams due to their ability to encourage cell turnover. Furthermore, sugar is a natural humectant, and as I detailed in this article, it means that it attracts water from the environment, helping your skin maintain moisture. This oil is just one of those things that has grown in popularity over the years, and rightfully so! It has a low molecular weight that allows it to penetrate deeper than other oils, and it is full of healthy fats and acids to protect, hydrate, and nourish skin. As much as I love everything about coconut oil, however, I find that sometimes it is a little greasier than I would like a product to be. If you find this to be true, you can use any other oil that is more suitable for your skin type, like jojoba oil which I love and talk about here. This precious oil has anti-inflammatory, analgesic, antiseptic, astringent, and vasoconstrictive properties, as well as containing menthol which is known for soothing skin. It also helps regulate the production of sebum (natural face oils), contributing to less acne and making skin visibly healthier. These citrus oils have many beneficial properties for your skin. Most of it has to do with the fact that they are mild antiseptics that protect skin from impurities and that they have astringent properties which give skin a more youthful appearance. Plus, citrus scents have the power to make us feel more relaxed and energized, which translates into an overall sense of wellbeing. 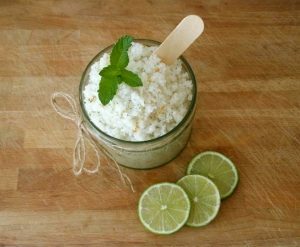 Just like the cocktail, this Mojito Scrub is wonderfully refreshing thanks to its citrus and minty qualities. Actually, now that I think of it, you could probably add some of this scrub to a any tropical cocktail to make it even tastier, too. I dare you to taste it, it’s actually one of the most delicious things ever!